Crystals are beautiful. They have been prized and admired since the beginning of civilization. They were assumed to have magical power because they seemed so magical themselves.In science, we have a whole different kind of awe for crystals. The symmetry of atoms arranged in perfect snowflakes and the utter clarity of quartz and diamonds can be breathtaking, and reflects the basic nature of atomic structure. So it is of little surprise to find that 2014 has been declared the International Year of Crystallograpy (IYCr). This year marks the centennial of the discovery of X-ray crystallography and the 400th anniversary of Kepler’s observation of the symmetrical form of ice crystals. Among the goals of the IYCr are to increase public awareness of the science of crystallography and to promote education and research in crystallography and its links to other sciences. One of their major activities is to sponsor an International Crystal Growing Contest. These sorts of contests have been popular in the past. While the details of the IYCr contest have not been finalized, there are a number of other well-supported contests for 2014. One well-established version is sponsored annually by the Chemical Institute of Canada (CIC). Although it is only open to students in Canada, they have an excellent crystal growing handbook online, just in case your ACS ChemClub would like to try growing some crystals. Of course, if your ChemClub is in Canada, you are all set!. To celebrate the IYCr, the Molecular Structure Laboratory of the UW-Madison Chemistry Department has launched the Wisconsin Crystal Growing Competition to be held April-May 2014 among Wisconsin high school students. The results of these competitions can be quite spectacular. In Canada’s CIC National Crystal Growing contest, students routinely grow copper (II) sulfate crystals weighing over 50 grams. 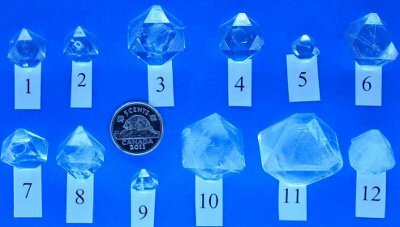 The crystals could be grown much larger, but the CIC limits the competition to just five weeks. In 2002 one of the crystals submitted was graded as ‘perfect’ with a score of 10.0 for the first time in the competition’s history. The world’s record for the largest copper (II) sulfate crystal weighed 69.8 kg (153.88 lb) as of July 21, 2010. It was grown by students in Neustadt, Germany. The Canadian newsletter Chem13News reported about a copper (II) sulfate crystal that was grown for several years, the last few months in a large garbage can. When it reached a meter or so long, they finally ran out of room and the crystal was given a coating and built into a coffee table! Stay tuned for news about the IYCr International Crystal Growing Contest, or if you qualify, join the contest in Canada or Wisconsin. Or, perhaps you can have your own competition between club members? If you decide to grow some crystals, be sure to send us a report and pictures.